Knowledge is power when it comes to anti-aging ! Notice as we age the once youthful ‘V’ shape to our face slowly transforms into a square. Facial structures begin to sag and skin begins to lose elasticity. If the aging process is something that concerns you, then understanding why this happens and knowing what to do about it is key to slowing down the aging process. Progressive facial fat loss is depicted in the above image (yellow) and to a lesser degree muscle loss (red). This inevitable breakdown is caused by the aging process itself with genetics and environmental factors also playing a role. Many patients don’t understand nasolabial folds (the nose to mouth lines) are not actual wrinkles to be directly filled. They are formed from loss of fat in the overall cheek area and replacing volume with dermal filler in this area is what gives a naturally lifted and more youthful look. Another example is eye bags or under eye hollowing. The upper cheek fat pad has slipped down and/or diminished causing the deficit under the eye. Again restoring volume in that area will give the best resolution. In general, an overweight person of the same age will have more fat in their face resulting in less volume loss whereas a thin person’s face may appear very saggy or gaunt. A person who has recently lost a lot of weight may show accelerated aging in the face as well. Bone, which is the main scaffolding for holding our soft tissues in place (skin, fat, and muscle), is also lost during the aging process. With less supportive bone structure, our faces fall even more. Now what about the skin itself? As we age our bodies produce less collagen which can show as wrinkles on the skins surface. Again, genetic and environmental factors play a huge role in this. 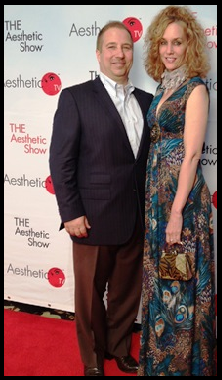 Number #1 attributing factor to accelerate collagen loss is sun damage. 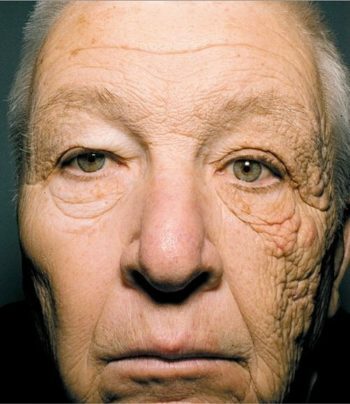 This gentleman was a truck driver for all his life and the left side of his face shows the sun damage he received driving everyday with the sun beating down on him through the glass. If this doesn’t curtail your sun exposure or encourage use of sunscreen, I don’t know what will ! Number #2 is smoking. I can’t give you enough reasons to quit that. So because there are multiple factors as to why we age (fat loss, bone loss, and loss of collagen in our skin) There is no one procedure that can fix all three. For the skin itself, we offer chemical peels and micro-needling to aid in collagen production to improve skin elasticity and texture. Botox also works to soften certain wrinkles that are caused by repeated facial expression. The most common areas being treated are the forehead, frown lines and crows feet on the sides of the eyes. Loss of facial fat and bone can be masked with various dermal fillers customized for different areas of the face to replace volume. Dr. Gallo’s beautiful and natural results not only rely on skilled precision and understanding of facial anatomy, but on an artistic talent which can’t be taught. This is what sets him apart from many others.